What is Gather in the Garden? The connection between humans and our Earth are never ending. Each Wednesday after school, we'll be "gathering in the garden" to help our young people turn their innate knowledge of the world around us into real experiences. Adventures through basic earth science, energy and growing cycles and community stewardship concepts will be the focus. 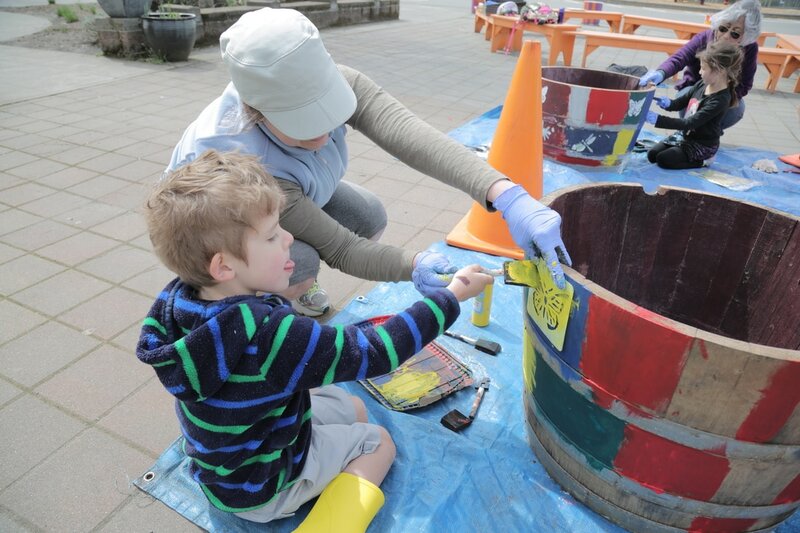 Adults are encouraged to help embark on this youth garden adventure just as much as the kiddos are. This class maxes out at 8 students but for each adult that signs up to attend two more student spots open. Please sign up for the after school class through enrichment. Start and end dates and times will follow the enrichment calendar. 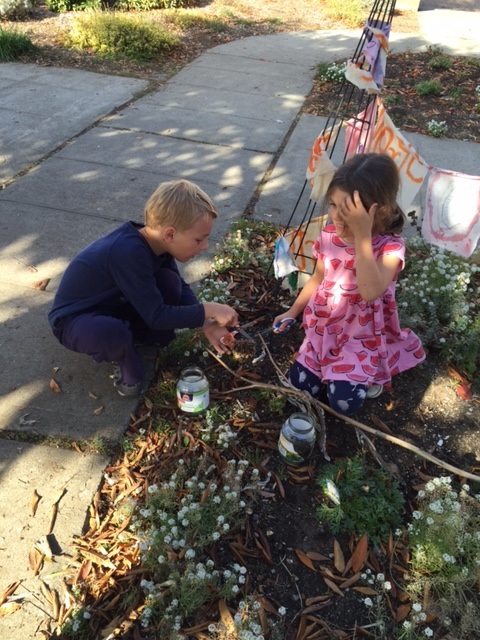 For any questions about our garden, please contact Andrea Hildebrandt and mates at garden1@qaeptsa.org. First Semester of Gather in the Garden/Green Team Re-cap. We've had a young class of kiddos putting on their scientists, biologists and animal behaviorists hats for the last 18 weeks or so. Holy acorns! These budding naturalists have learned a lot and so have I! Did you know that seeds can grow, germinate in a plastic bag? I didn't but now I do! Below is the list of some of what we explored all semester. Enjoy the show on the right! 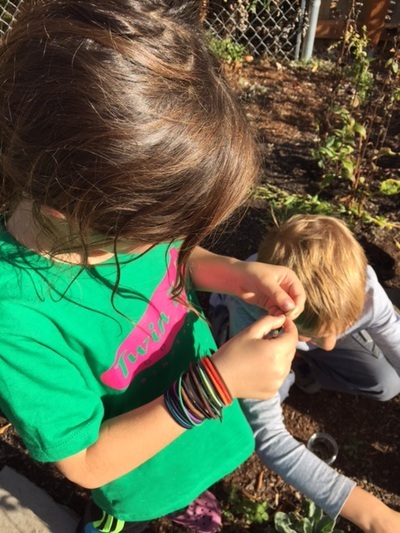 QAE students are looking forward to continuing second semester outside at our p-patch! To register for Gather in the Garden second semester 2018-19 visit the enrichment page. It's the year of stewardship. Lets leave this place better then how we found it. Giving thanks and care for the living world around us by interacting, observing, listening, learning, conserving and helping is one of the most important things we practice. Cindy Reiner, Shalini Rao Nilakantan, Quincy Ninh, Mary Rea, Haru Komuro, Tiffany Robinson, Tamara Convertino and Rachel Marks. As you all know, since our community is at a temporary location, opportunities to have garden and eco-literacy adventures are different. 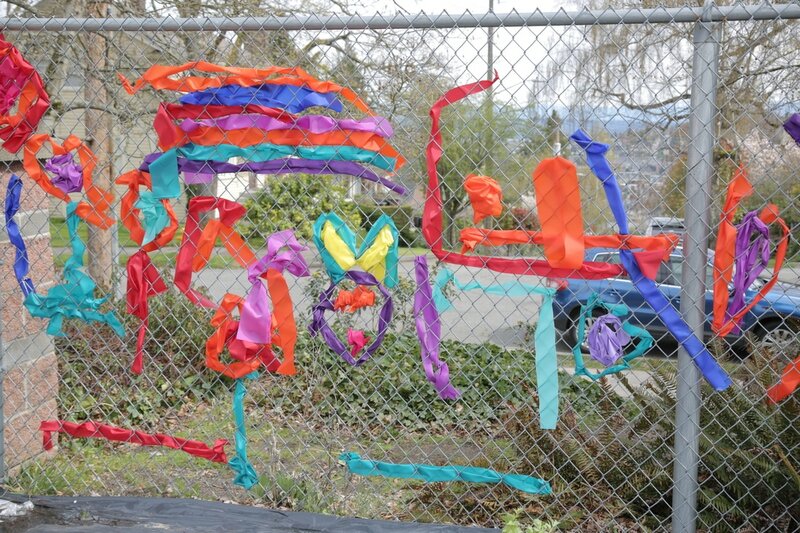 The Queen Anne P-Patch Summer classes were amazing! We hope to continue providing this learning option for all families on Wednesday afternoons. Stay tuned-in for information about the school year enrichment class. There might be some opportunities to do some gardening around John Marshall as well. 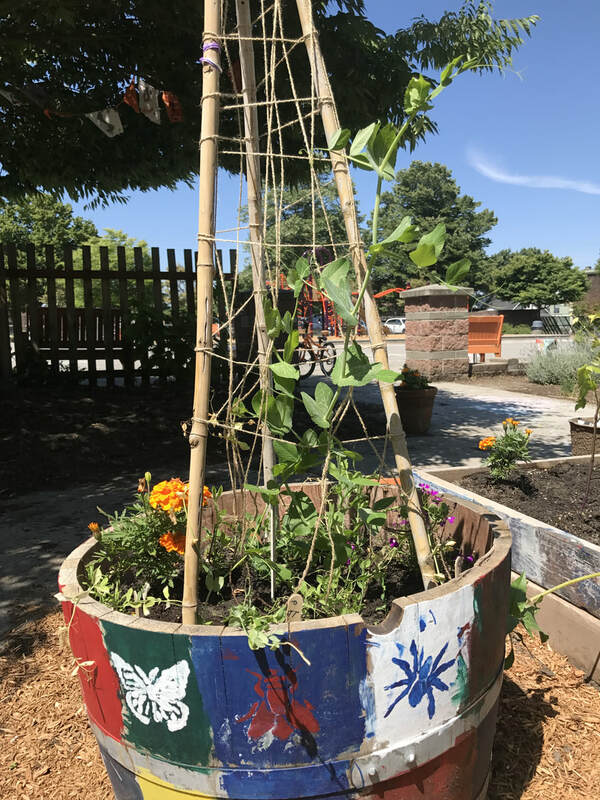 Until then, there is a P-Patch open house this weekend September, 15 9:30-12:00 a.m. Greet the morning here and relax in the afternoon at Woodland Park for the Back to School Picnic 10a.m.-2p.m. See you all outside on Saturday! This Summer we've been playing, exploring, creating and discovering in the Patch! GARDENERS CHECK THIS OUT! MEET IN THE GARDEN! GET THESE DATES ON YOUR CALENDAR! KLATSCH: A social gathering, especially for coffee and conversation. Summer is coming and gardens around us are growing! 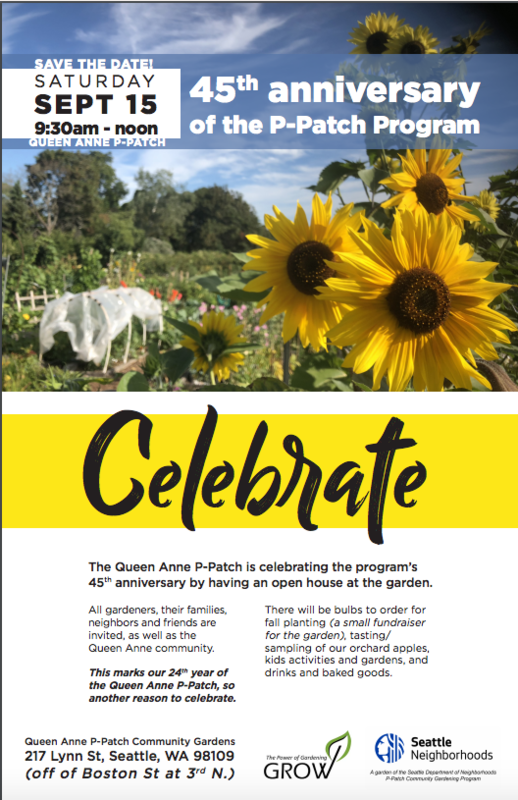 Saturday, June 23 at the QA P-Patch (301 Lynn St.) from 9:30-11:30 a.m.
All are invited to have coffee, pastries, kid-friendly and garden variety snacks while getting to know other members of our greater QA Neighborhood. Check out the QAE Garden Patch, find out how you and your family can get involved, crafting and nature hunts for kids, ask questions and enjoy the morning. We're happy to offer this class on various Wednesday mornings 9:30-11:30 at the QAE P-Patch! 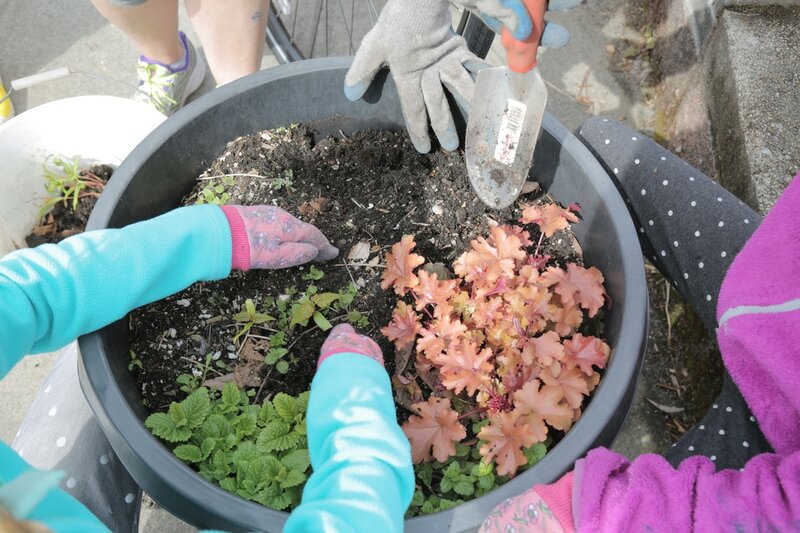 Your child can expect to get dirty while exploring much of the beauty surrounding them while learning basic garden maintenance, stewardship and care of plants and other p-patches. There will be some focused topics that align with what plants are currently in bloom or ready for harvest. Lessons connected to our local urban wild life, flora and fauna that live in and around the p-patch will also be incorporated. 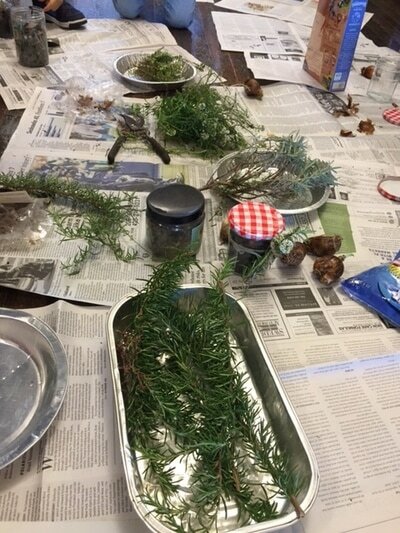 Some nature crafting is most definitely going to happen as well! 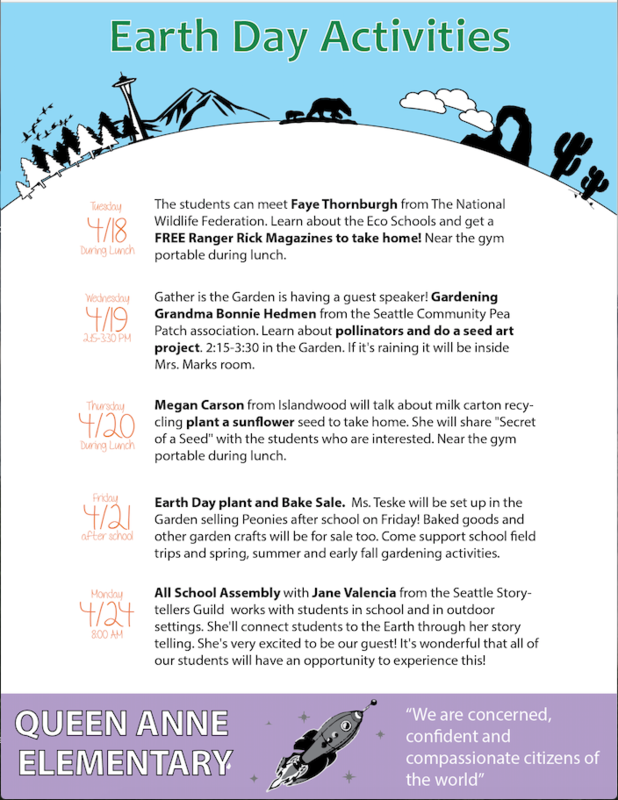 Spring Garden Info from Seattle Public Schools: Bring a friend or shoot me an e-mail if your looking for one. The parent support for this week has been amazing! We had more parent volunteers this year then last and I expect next years to grow even more. 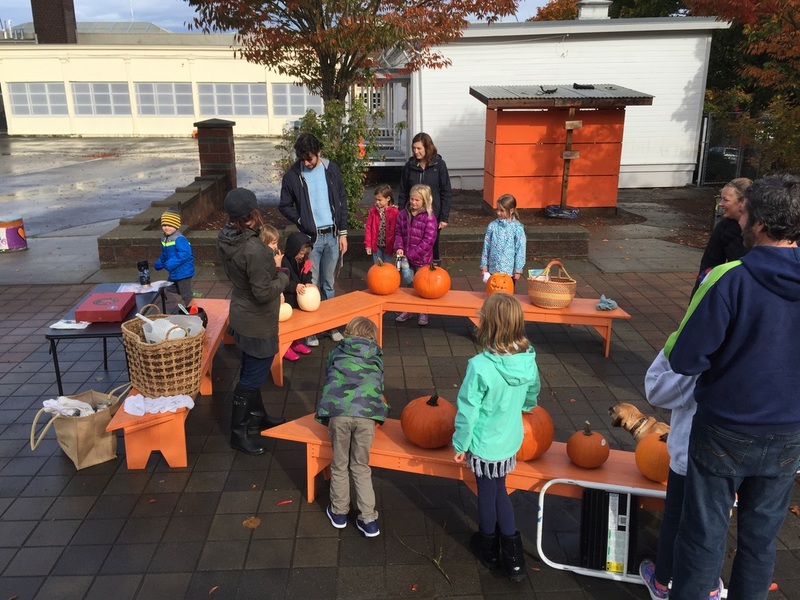 The students had so much fun thanks to our community guests like Salena from City Fruit, Natalie from Seattle Tilth Alliance and Owen and Ryan from Owen's List and last but not least Anne Marie Canlis and Brittany from the QA Farmer's Market and Mrs. Kristin Teske and her Peonies. Collaborating with 4th grade IlandWood fundraising students and parents was a joy. Thank you Jody Scott, Melanthia Peterson, Jody Stewart and that isn't even all of them. Kindergarten parent volunteers get a big shout out too; Dasha Narog, Jeanine MacQuarrie, Haru Komuro and Tamara Convertino. Thank you to Nicole Forest for sending us help too. Special kuddos to QAE teachers, Lorin Belcher and Laura Shaw for pulling their students together and encouraging them to participate in the assembly. Enjoy the pics of tasting, creating, planting, dancing, printing, learning and sharing. Our GG students did an amazing job selling seed packets and raising money for Lowell Elementary Island 2018. Through this experience they not only learned about the amazing powers a seed has but that people of all color have contributed to our environment in a positive impactful way. Like Rue Mapp and Will Allen. Enjoy the pics QAE and happy Earth Day Every Day! This is for the future of our future's future....you know! I'm happy to bring you the buzz about some special school guests. Meet the Mason Bees! A few parent volunteers, with Janine's help, have come together to bring non-aggressive, native pollinators, Mason Bees to our school. 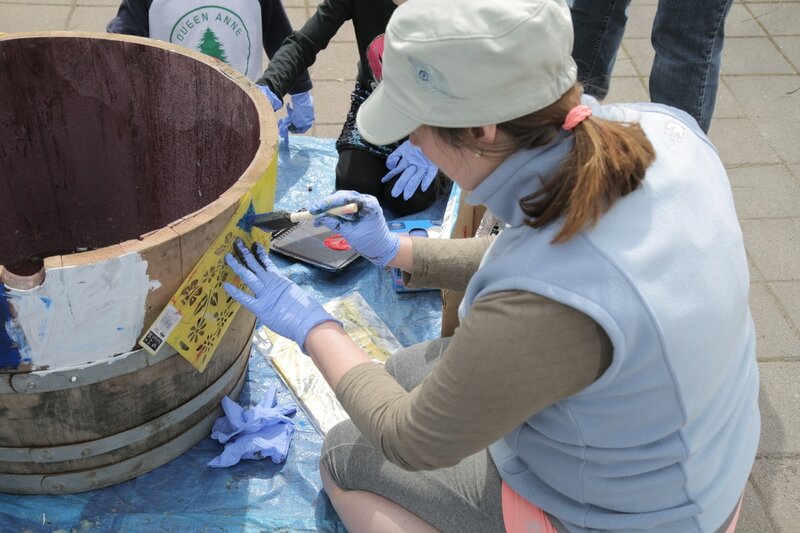 Our hope is that teachers and students will learn more about the important job they do in providing a ecologically healthy and balanced environment. 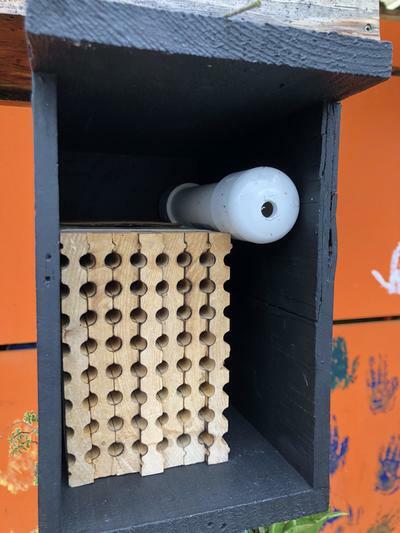 By hosting Mason Bees we can make an impactful connection with our students. 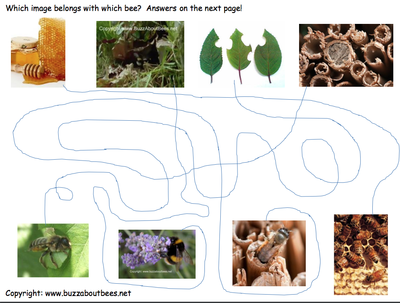 We hope you find Mason Bees as interesting and fun as we do! Mason Bees do not sting because they don't have a queen to protect. Therefore, they are great for educational purposes. That said, please remind students to be respectful. As with all living creatures, they can be provoked. The hive will be located on the outside South facing wall of the music classroom portable. It will be put up as soon as the outside temperature reaches a consistent 50 - 55 degrees F. 3-5 days after, the males will hatch out of their cocoons and another 2-5 days after that the females will hatch. The males will fertilize the females and then for the following weeks up until June the females will collect nectar to bring back to the hive where they lay their eggs. As they collect nectar they will be delivering pollen from flower to flower. They will fly as far as 300 feet (1 football field) in search of pollen nectar sources. Mason bees prefer to feed on nectar and collect pollen from fruit trees like apple, cherry, and pear. They also forage on dandelions and Oregon grape. We have lots of dandelions in bloom around QAE! They'll like the grape in the garden and native plants. Please let students know that picking the flowers takes away food for our bees. Female Mason Bees need to build their chamber walls with moist clay soil. Our garden soil varies so to ensure they have a source of clay, rather than sandy soil, there will be a special container or spot in the garden that has this. The Garden volunteers will maintain this. With the support of teachers, staff and students we hope it will not be disturbed too much. 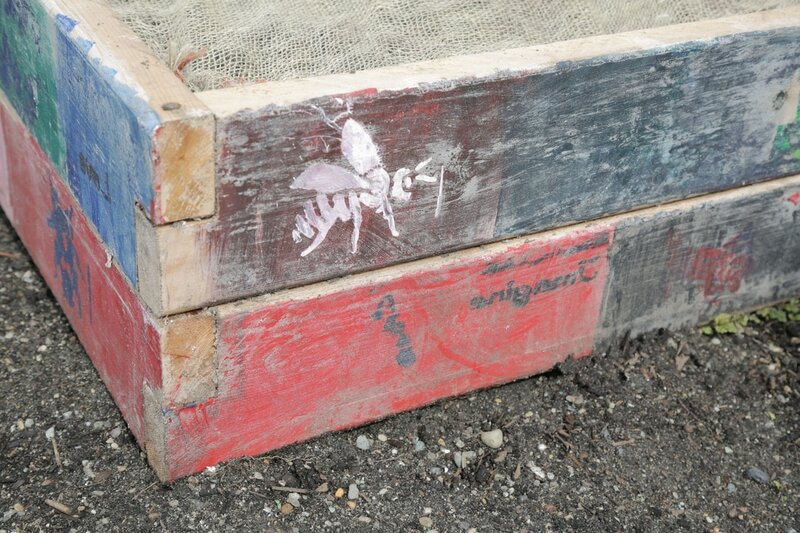 If clay mud is not available, then mason bees will not use our hive. 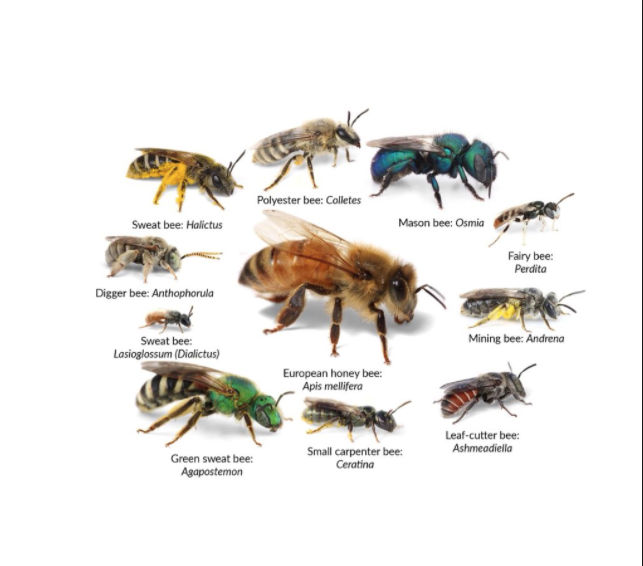 https://www.rentmasonbees.com/pages/faqs-links - This is where our Mason Bees came from  Great FAQ page! https://catalog.extension.oregonstate.edu/sites/catalog/files/project/pdf/em9130_0.pdf - Great info about life cycle and images. https://www.nwf.org/Magazines/National-Wildlife/2016/AprilMay/Gardening/Bees - Great overall writeup about importance of native bees, what is threatening their existance and solutions/how we can help. https://www.buzzaboutbees.net/mason-bees.html - Includes a video of bee mating behavior. https://www.goodreads.com/book/show/23503659-mason-meets-a-mason-bee - Lastly a great, simple and fun story of a boy's interaction with a talking Mason Bee. Includs k-5 curriculum. I have this book and am happy to copy pages, let you borrow it or both! 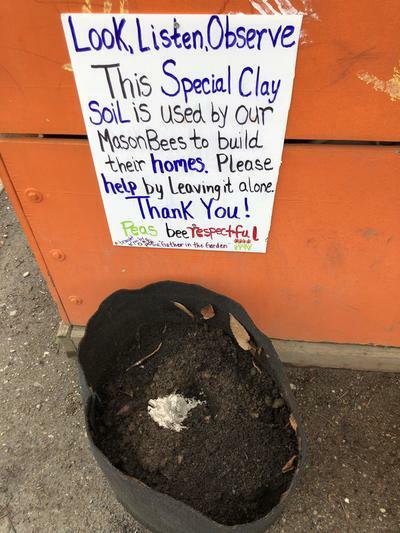 If your kiddos would like to help make signs for the Mason Bee Hive or the Special Clay Soil please let me know! 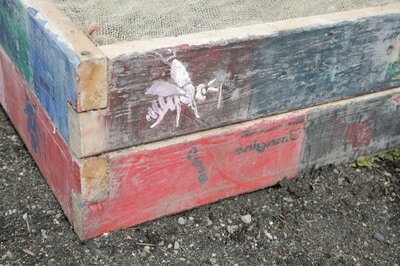 They will posted near the hive and the clay soil. I am so grateful that Mrs. Roy is supportive of this environmental stewardship learning opportunity. I believe it is something new and different for our school. I hope you find it a positive experience. Getting any and all feedback from any of you would be appreciated! 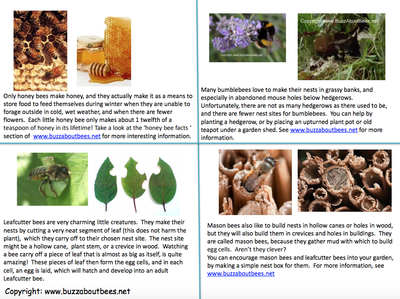 It's wonderful to bee a parent in our QAE community. You all are no doubt, the bees knees! Happy April 1st! Welcome to the month we celebrate all that the Earth provides for us and how it sustains life. There is so much to celebrate this month. 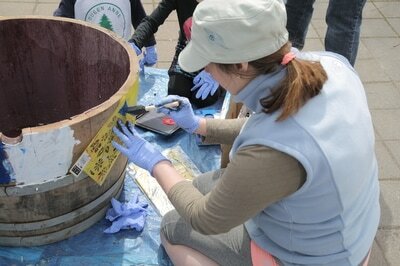 Did you know that Arbor Day is April 27th and National Park Week is April 21-29th? Earth Day is April 22nd! We have a lot of guests from our community visiting our school the week of April 16-20 for our Earth Week Celebration. These are people who work with environmental/stewardship/educational/Native Community organizations. Some are local to Queen Anne and some are Seattle or regionally based. A handful are QAE parents! Many are students and a few passionate teachers. I want to shout out 3rd grade teacher Mr. Liner and Mrs. Belcher who have worked hard to provide a well rounded PBL about Salmon. A few weeks ago I was lucky enough to observe a visit from the Seattle Rain Wise Program. 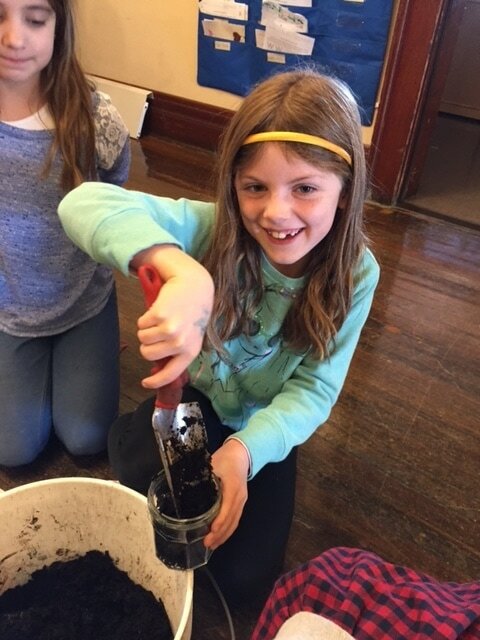 Our 3rd graders learned about our Seattle Watershed, where is starts and ends and the importance of that millions of years old water cycle here on Earth. The impact humans have on the cleanliness of our water is much easier to see the more we learn about it. So keep on opening up to all of the life cycles on this breathing, living, feeling planet. Let's Celebrate! Everyone is always invited! 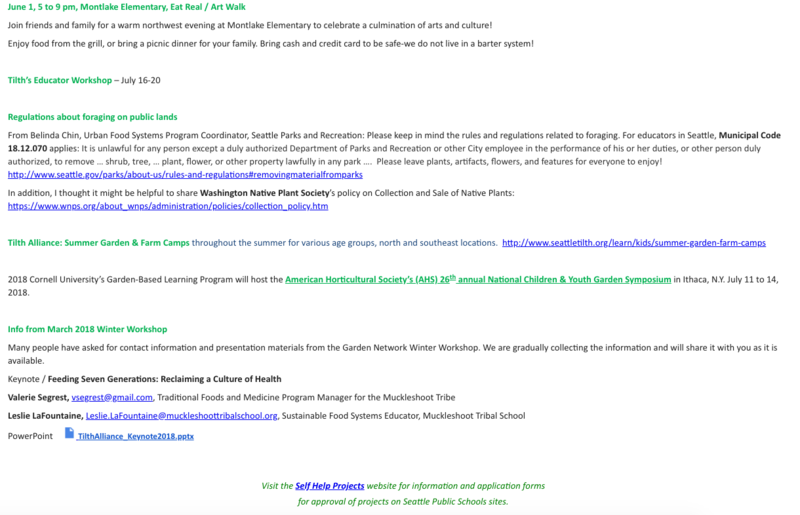 One thing not included on the schedule is the 3rd Grade Public Announcements about Salmon at the Ballard Locks on Earth Day weekend, April 21 and 22. It hasn't been finalized yet so stay tuned in for details as they develop. 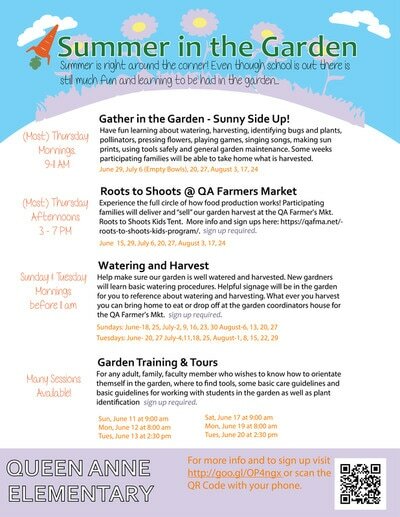 Check out the schedule to the left and write to garden1@qaeptsa.org with your thoughts. We need your recyclables! Before we adventure off on Spring Break please bring in your clean and dry recyclables. 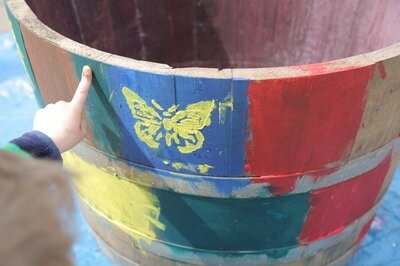 There will be collection boxes near the entrance to the Tree House and Brick Buildings next week, March 30th-April 4th. These materials will be used at the Recycled Instruments Creation Station set up after school on Monday, April 16th. 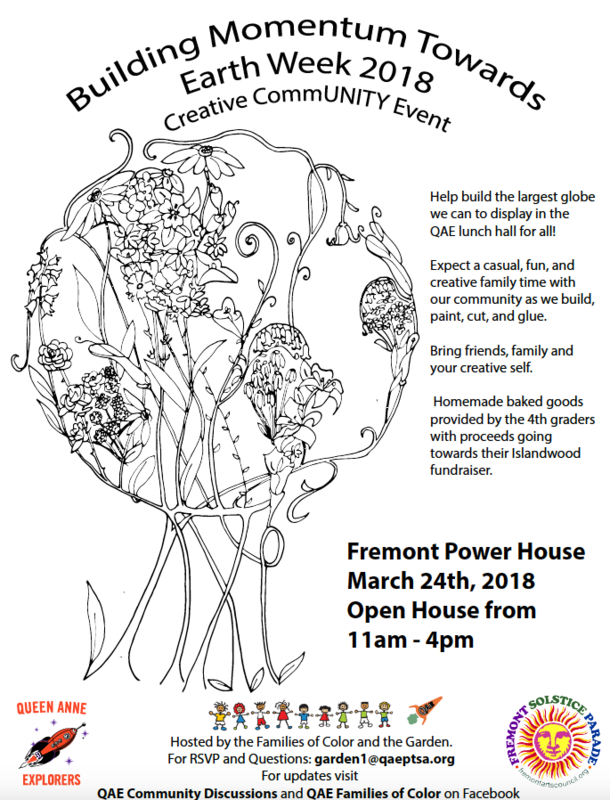 All students young and old are invited to repurpose and create as we kick-off Earth Week, 2018! Thank you to everyone who came out and helped build, create and support Islandwood students! There were upwards of 50 people! Success!! We'll be gathering again this Friday night at 6:30-8:00 to do some final touches. Please join us if you can! Here is the dirt about our Creative CommUnity Event. We need your paper bags: The grocery bag type. This will be the base material for paper mache. Please bring them to the receptacles near the Tree House entrance and the Brick Building Entrance from Monday, March 19th - Friday, March 23rd. 1. Paper macheing the Globe of our Earth and taping on the continents. On each strip write what you are most grateful to the Earth for...making it a globe full of gratitude. 2. 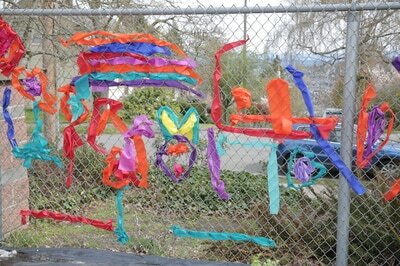 Creating whales, salmon, birds, trees, people and bees. 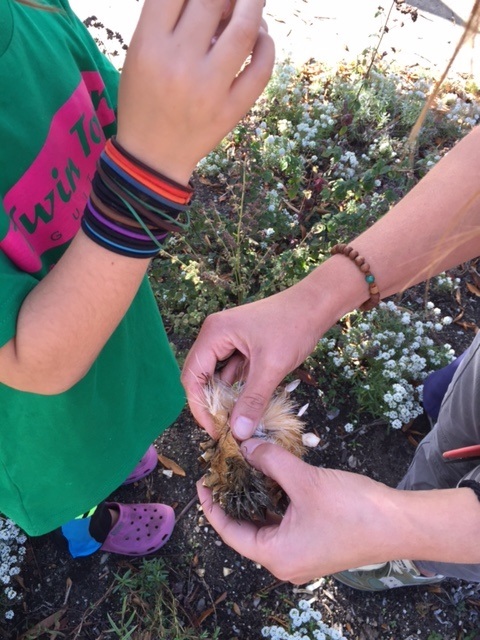 Can you guess what living creature represents each of our QAE grades? 3-5 Volunteers needed! Sign-up Here. 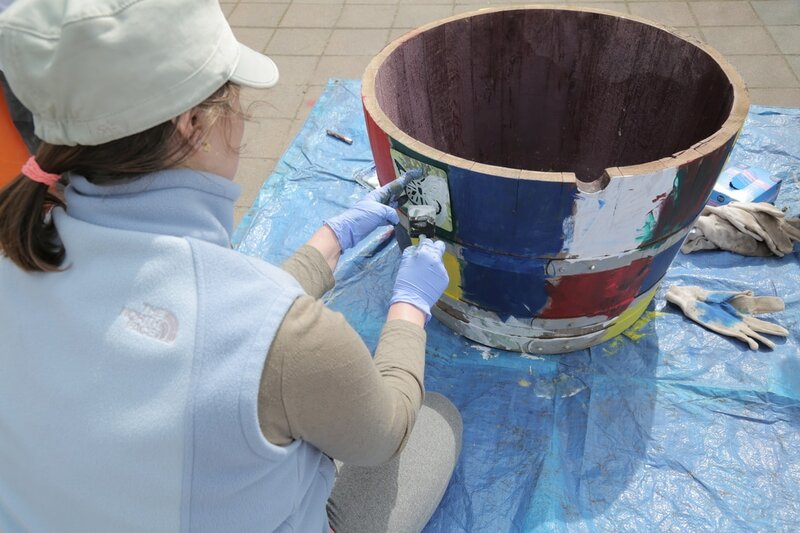 The Earth will need to dry out before we add the final layer of blue and green paint. Gather in the Garden students will do this part of the project. 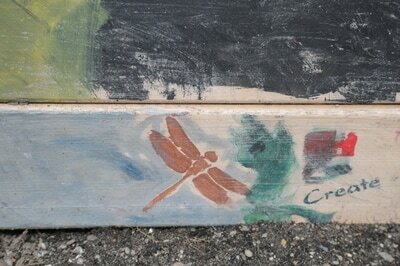 Adding the living creatures will be the very last step before it's ready to hang in our Lunch Hall for All! Stay tuned in for when and where that will take place. Whoot to YOU! For digging into this creative momentum building journey! Earth Day is April 22nd. It's a fortunate time when so many community members come together to celebrate the diversity of life that our Earth sustains now and for our future generations! Your participation anchors the root message to our students that we care about their future! Sorry for the late blog update! Our November Big Dig is all about finding new homes for the perennial garden plants. Come June, our garden space is going to be sadly bulldozed. The good is that it makes new classrooms for our growing population of students. That said, our plants are part of the history of our school. Teachers and administrators that founded our school decided they value our an outdoor learning classroom. It was well maintained at some points and at other times it was not. I hope to continue to maintain the momentum of those and these good times even as we enter a new time of uncertain growing spaces. It charges us to be creative and open minded about how to grow and learn as we are in a temporary space and we evolve. Facing new challenges is what life brings. 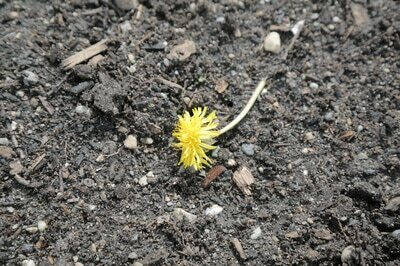 Dig up now as these plants go dormant for beautiful blooms in the spring/summer. Learn how to build a cloche for winter gardening. Have fun meet new people! Bring extra shovels if you have them. 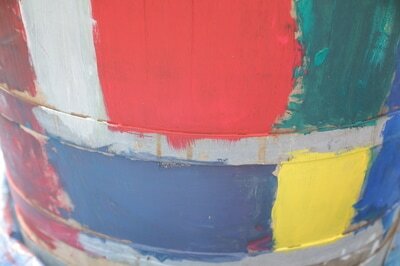 We are collecting medium to large plastic pots for this project. Please bring them to the office. Find us on the play ground, in the garden or around school. We hope your family participates in this growing adventure with us! Monday, October 9th, 2:30-4:30 p.m.
To show your spirit and support wear RED on this day! We are honored to have Mr. Blake Shelafoe from the Duwamish Longhouse and Cultural Center visit our school on this important day. All families are invited to join and respectfully observe as he conducts a blessing ceremony for our garden. After, everyone is invited to help plant PNW native plants species. The Duwamish are considered to be Seattle's First People and are the people of Chief Seattle. www.duwamishtribe.org . Thank you to Oxbow Farm Native Plant program for the special donations and the Duwamish Long House Cultural Center for sharing this enriching, cultural environmentally educational experience with our community. In the Spirit of Indigenous Peoples Day we invite our QAE community to wear the color red. This event is brought to you by our PTSA Garden group and our QAE Families of Color group. What a beautiful and powerful experience. Our guest felt honored and respected by our QAE Community of students, teachers, parents, families and administration. Here are some images and video of the time we spent with Mr. Shelafoe. Thank you to Christa Winquist for photography and videography. 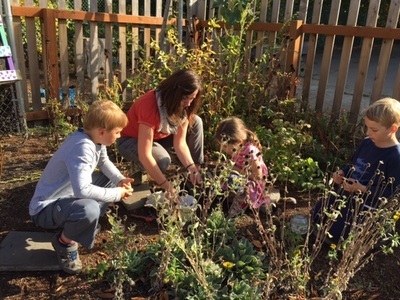 Ozette Potatoes were planted by the 2016-17 4th graders as part of their NW Peoples studies. 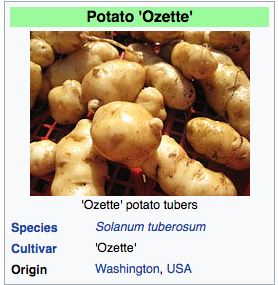 The Ozette, also known locally as Makah Ozette or Anna Cheeka's Ozette is the oldest variety of potato grown in the Pacific Northwest region. This potato, of the petite heirloom fingerling type, was grown for over two centuries by the Makah tribe native to Washington and was "rediscovered" in the late 1980s. The name "Ozette" is derived from one of the original five villages of the Makah tribe. 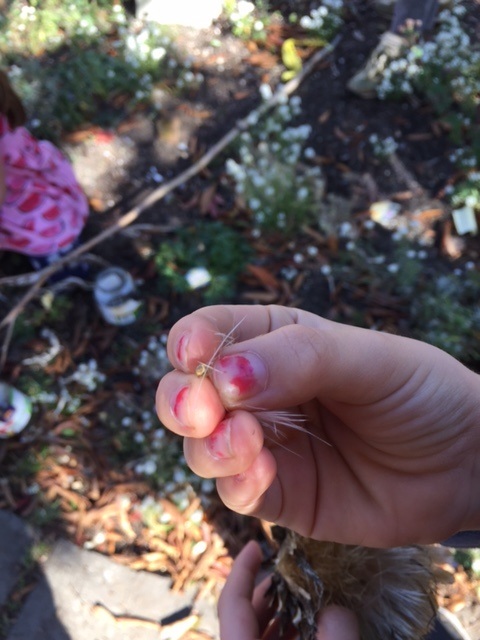 "Showy" Milkweed seeds were planted by the 2016-17 4th graders as part of their NW Peoples studies. This species is also known as Western Oregon's native species. As the migration patterns of monarchs happen, they make their path eastward right at the northern border of WA and OR. Making this a regional native species that can me found in mid and eastern WA as well as Or but not western WA. We experimented with the seeds and they germinated! This photo is not what our plants currently look like in the garden. No flowers have developed yet. The stems and leaves look healthy and strong. 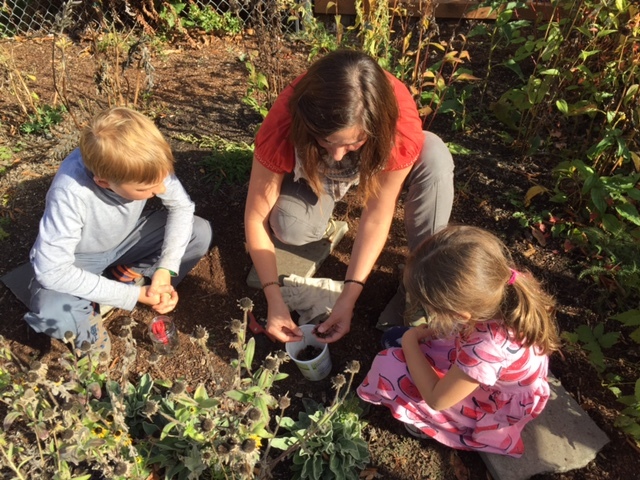 QAE Garden is powered by 100% clean volunteer energy! A special Garden Informational is taking place for incoming Kindergarten families the week of Jump Start. Thursday, August 24th following drop-off. Please gather in our beautiful library for coffee and donuts. 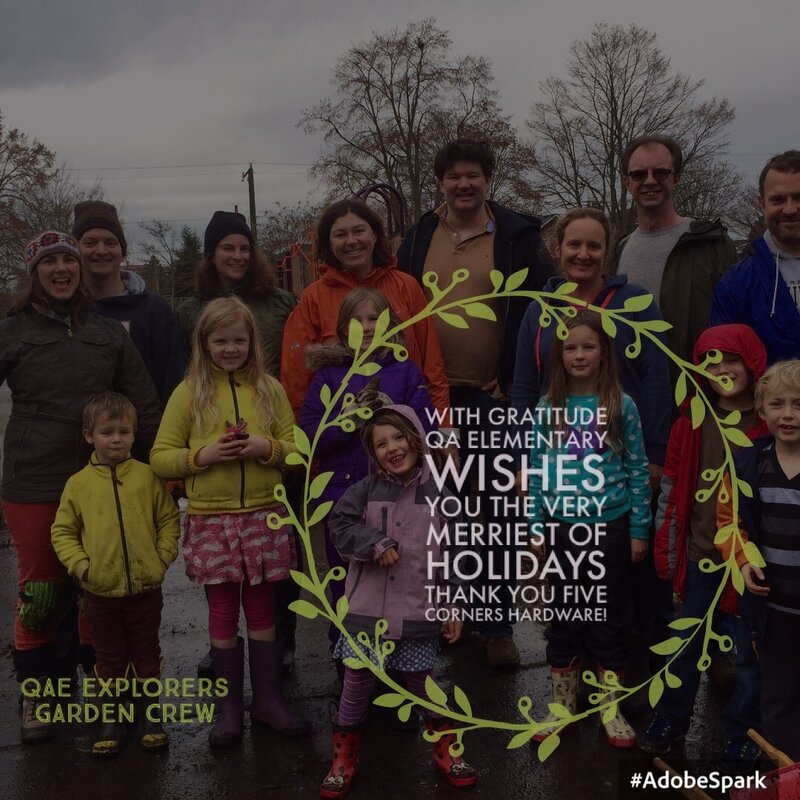 Listen, relax and get to know one another as the garden coordinator and crew share all that the garden has to offer your family. There will be a PTSA representative and other QAE community reps gathering as well. Summer is right around the corner! 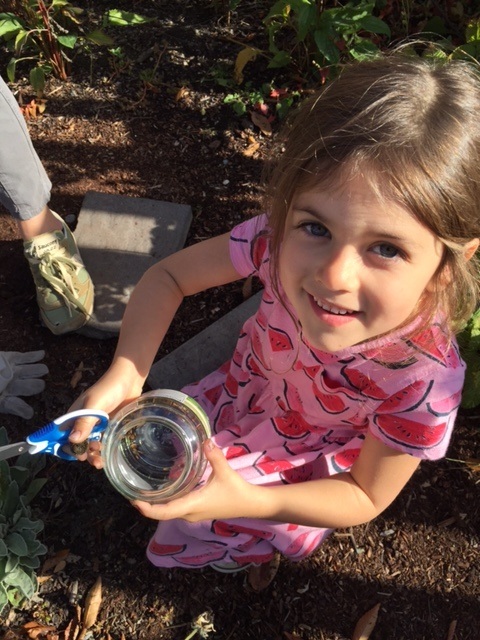 Even though school is out there is still much fun and learning to be had in the garden. To that, we will continue to explore and discover! We hope you can join us on our journey. We'll need a lot of helping hands this summer. Please read on to see how you can contribute and have fun! Where: QAE Garden and QA Farmers Mkt. Sign-Up Here! for selling at the Farmer's Mkt. Thursday mornings come Gather in the Garden - Sunny Side-Up! We'll have fun learning about watering, harvesting, bug identification, plant identification, pollinators, pressing flowers, playing games, singing songs, playing instruments, making sun prints, using tools safely and general garden maintenance. The second hour we'll prepare our harvest. Some weeks participating families will be able to take home what is harvested. Other weeks participating families will have an opportunity to deliver and sell, for a suggested donation, at the QA Farmer's Mkt. Roots to Shoots Kids Tent. See specific dates above and sign-up here to participate! Yeah!! Very exciting and we hope that you will sign up for this as it's such a great opportunity to see how the full circle of food production works. It's a rewarded experience for our students as well! Who: All QAE students, families and friends. This is not a drop off program. 1 adult per 3 children is required. We hope that next year more classes will be able to participate and we'll have more volunteers to run the programming of this. Four classes is about all I could handle on my own this year. It has been and extremely rewarding process so far. The second part of this program is the planing of the seedlings outside in the garden, caring for them and taking them to market. 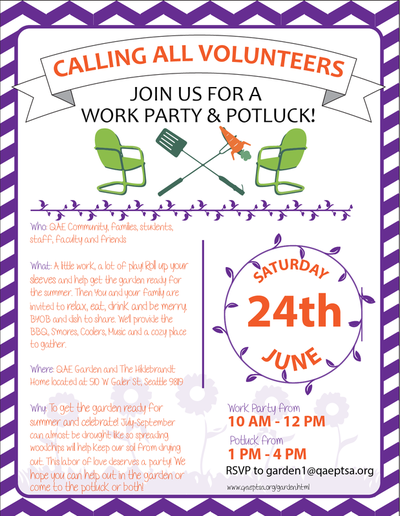 We hope that families who have students in the above classes will be the majority of volunteers for the garden this summer. How cool is that their student has the opportunity to follow this to market!!??? That said, the garden is happy to have any volunteer who is interested! As adult volunteers, we are supporting and the kids are the doing. 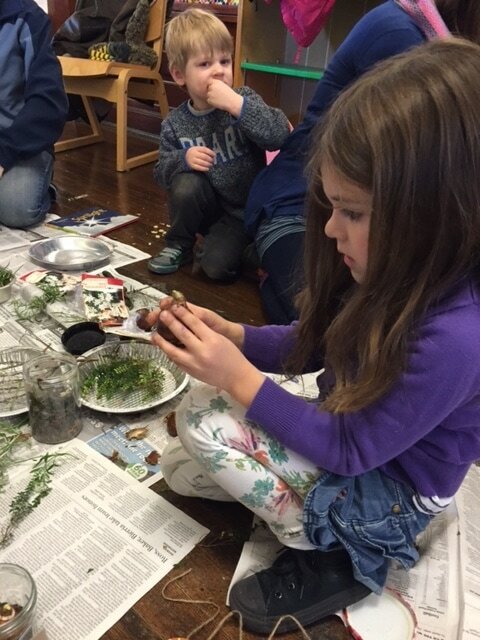 We create a safe, fun learning environment that inspirers the discovery of how all living things are connected. We are cultivating stewards of our living world. 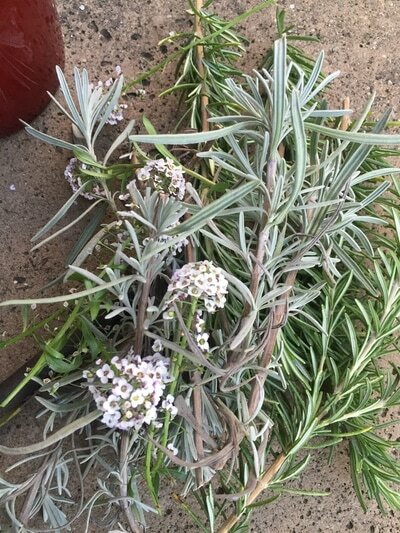 Summer Gardening Watering and Harvest - please sign-up to help! What: Help make sure our garden is well watered and harvested. There will be opportunity for you to learn the basic watering procedures. Helpful signage will be in the garden for you to reference about watering and harvesting. What ever you harvest you can bring home to eat or drop off at the garden coordinators house where it will be taken to the QA Farmer's Mkt. or taken to a food bank. Why: We live in a place where there is a drought from July - September most years. It's important to hydrate our garden three times a week during this time. It's important to harvest ripe fruit. If it falls on the ground it will attract unwanted pests, insects and rodents. 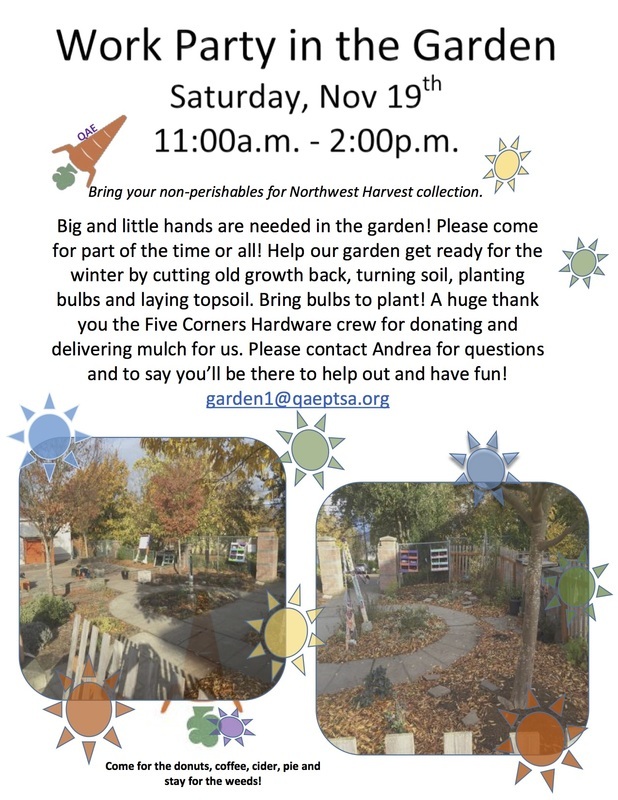 Our garden is a gift and here is an opportunity for our community to care for it. You and your students' involvement help create future stewards. 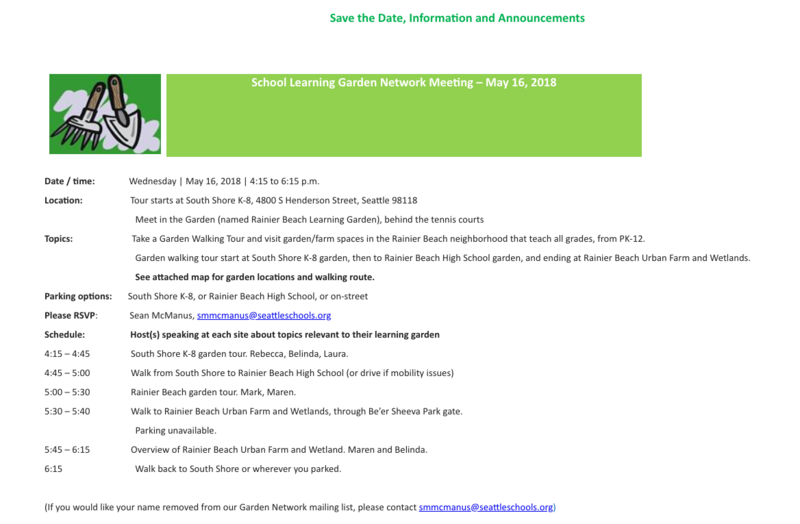 General Garden Training and Tours: For any adult, family, faculty member who wishes to know how to orientate yourself in the garden, where to find tools, some basic care guidelines and basic guidelines for working with students in the garden as well as plant identification. Half hour long. Saturday, June 17 at 9:00 a.m.
Monday, June 19 at 8:00 a.m.
Tuesday, June 20 at 2:30 p.m. When: Thursday July 6, 9:00 - 12p.m. 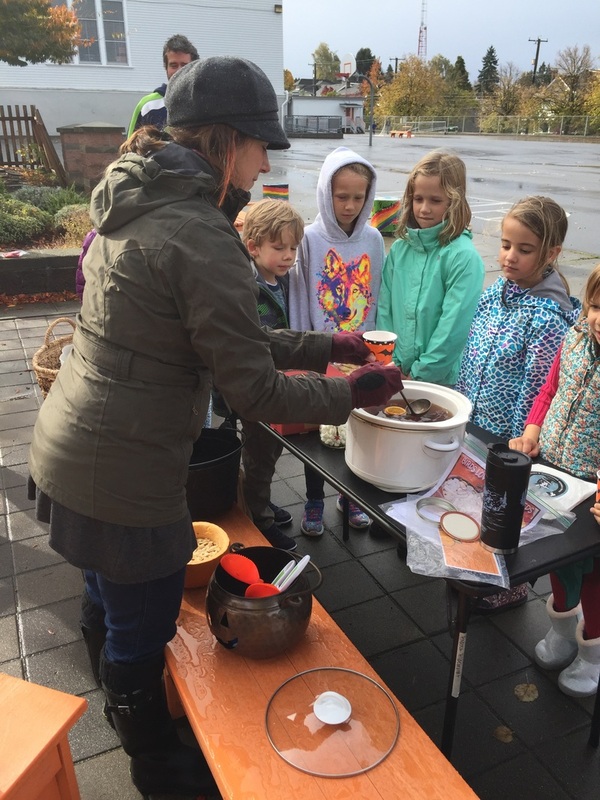 What: Students will create ceramic bowls in the garden with teacher Sandra Farmer who is also a volunteer and parent at QAE. There is enough supplies for 15 students. Why: In Washington State only 11% of children who receive free and reduced cost meals during the school year are accessing free summer meal programs. There is a huge gap where there are either too few summer meal sites or located too far away. The families in these areas are typically considered high-need and are most likely also utilizing their local food bank. We want to leverage this point of access for kids. - See more at Northwest Harvest Kids Summer Food Club Where we send the donations we receive! The basic idea for Empty Bowls is straightforward. Rather then soup and bread we may have students harvest a summer salad from the garden! 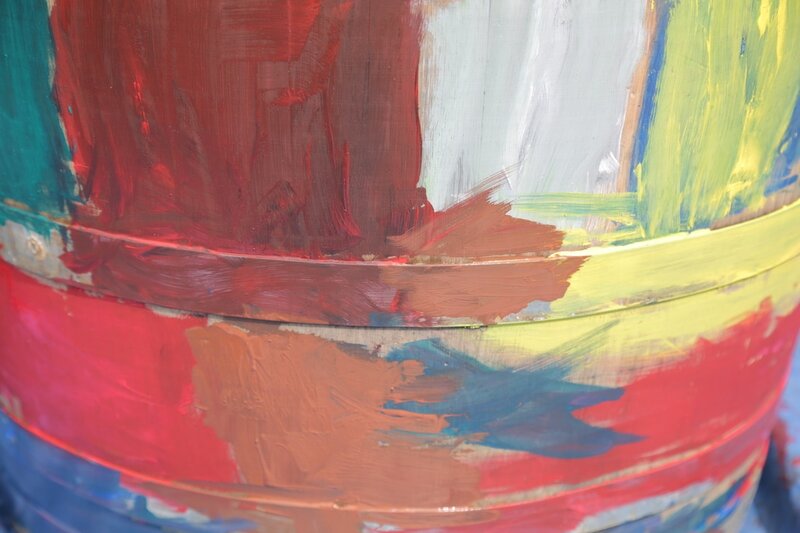 Participants create ceramic bowls, then usually serve a simple meal of soup and bread. Guests choose a bowl to keep as a reminder that there are always Empty Bowls in the world. In exchange for a meal and the bowl, the Guest contributes a recommended minimum donation. The Meal Sponsor selects a hunger-fighting organization to receive the collected donations. Any organization fighting hunger qualifies. 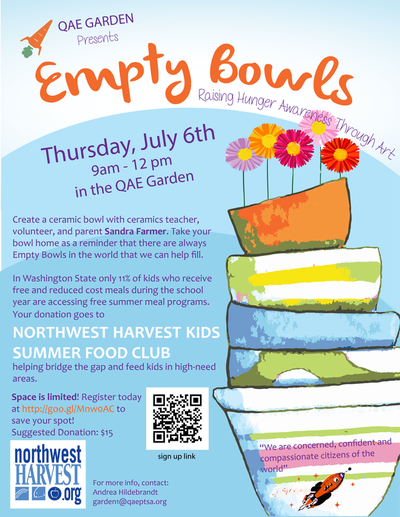 All funds raised under the name of Empty Bowls must be used for fighting hunger. Empty Bowls began in 1990 as an art class project in a Michigan high school to raise funds for a food drive. Students made ceramic bowls, served a meal of soup and bread, and invited guests to keep the bowl as a reminder of hunger in the world. 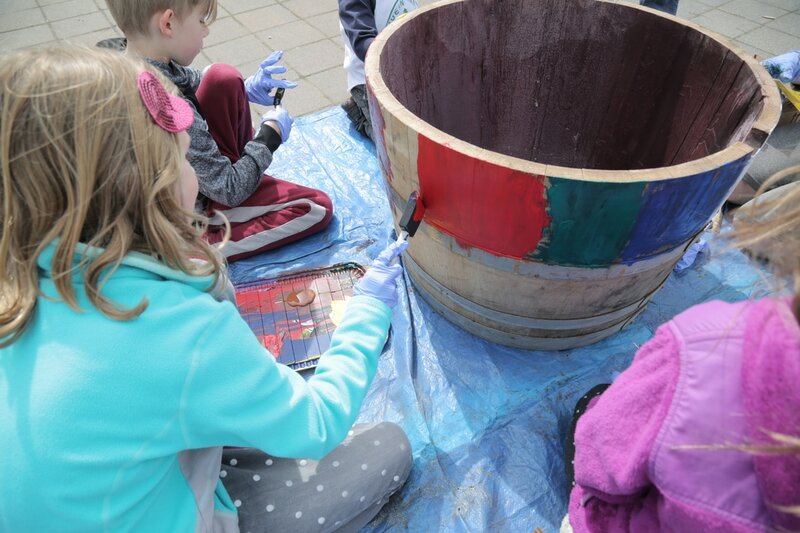 By the following year the organizers had developed this idea into the Empty Bowls Project and established the imagine Group, a 501(c)3 organization designed to promote the concept. Since its inception, this simple project has evolved into a far-reaching program providing support for food banks, soup kitchens, and other organizations that fight hunger. Empty Bowls events have been held throughout the world, raising millions of dollars for use in combating hunger. 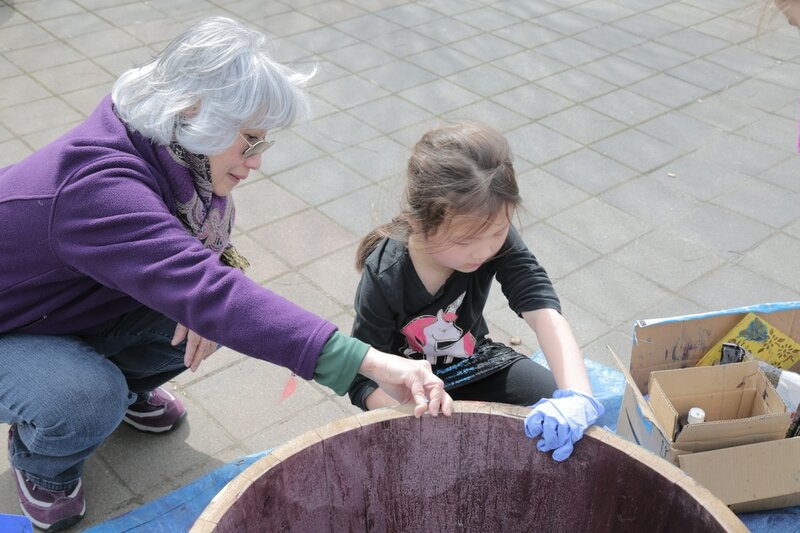 See The Clay Connection and Seattle Empty Bowls FB Page to find out more. ​What: A little work, a lot of play! It's a labor of love and gratitude. Thank you! Thank you! Thank you! You and your families are invited to come hang, eat, drink and be merry. BYOB and dish to share. 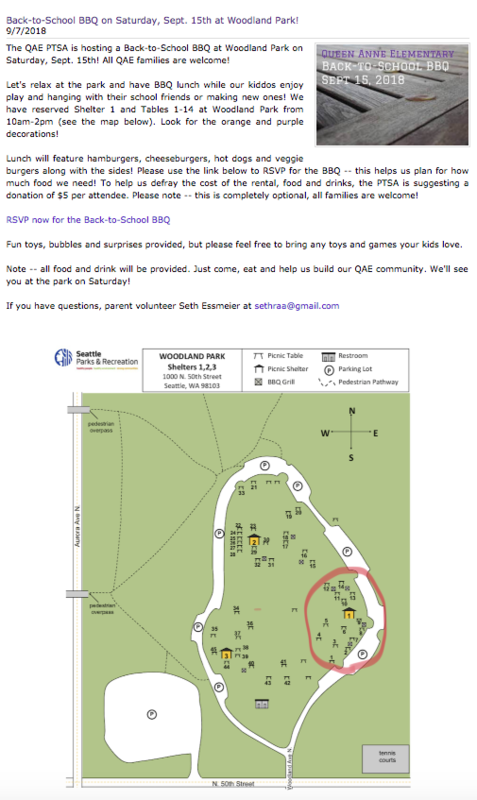 We'll provide the BBQ, S'mores, Coolers, Music and open our home for a gathering space (although small, it will be cozy). ​Why: As our Seattle summer turns into drought-like weather, typically, July into September, the wood chips and hay will keep the soil moist and prevent it from turning into plots of dust. It will be a good way to indicate appropriate walking paths and put nutrients back into the soil as it decomposes over the coming seasons. Cool! 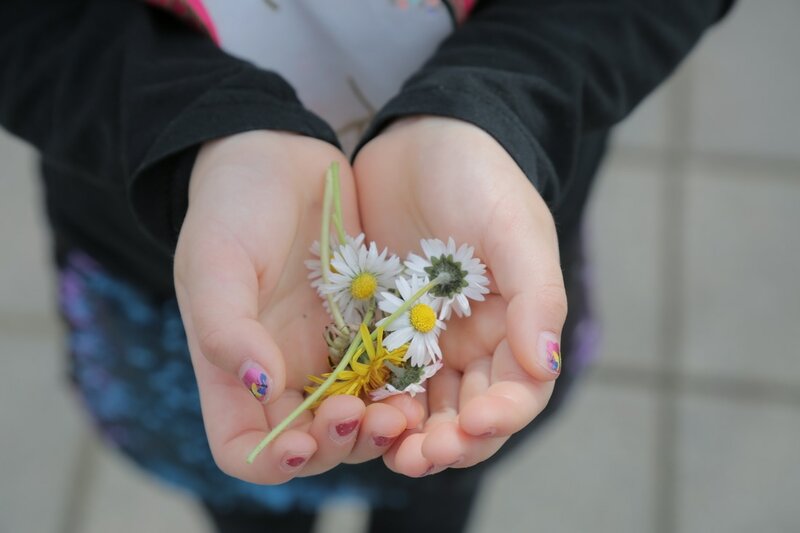 Out of gratitude for the garden, our school community, the work our students have done and everyone that has helped in the garden, we want to gather in recognition of it all. Evan if you haven't had a change to help in the garden but are happy for it's existence and our community please come and celebrate! I've worked hard and happily, with a few other parents, Mrs. Roy, teachers and community members to bring this time of year alive for QAE. We've put together a fun week/month! 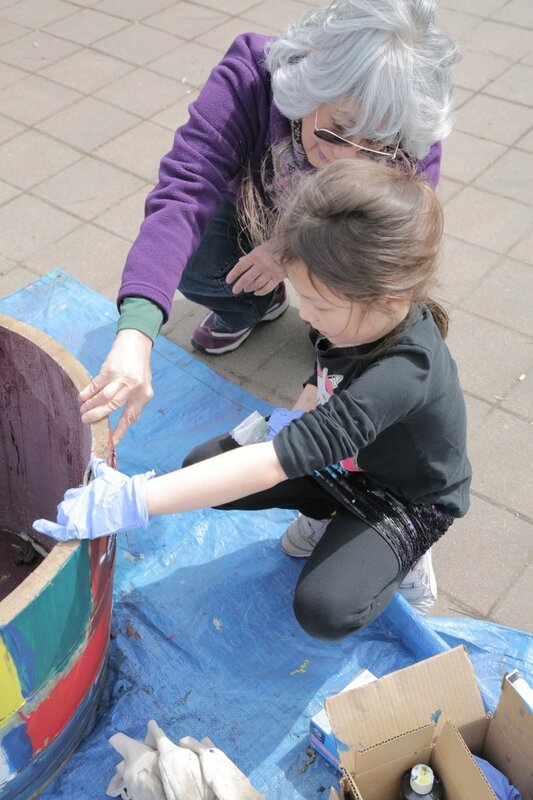 Earth Day is Saturday, April 22. Arbor Day is Friday, April 28. Two guests during lunch/recess for the students to meet. Location is somewhere between the lunch room and gym portable depending on weather. Please encourage your students to visit her table set up to share children's books about wind, solar, hydro and geothermal energy sources and pick up a FREE Ranger Rick Magazines to take home! *Thursday the 20th - Megan Carson will talk about Earth Day, growing food, plants and recycling through a simple project with sunflower seeds. She traveling from Bainbridge Island. 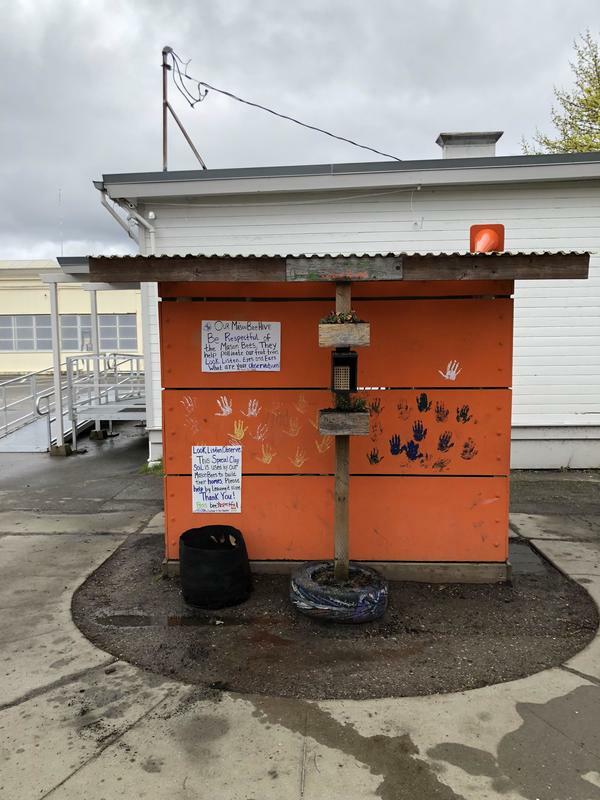 http://islandwood.org Please encourage your students to visit her in or near the gym portable. 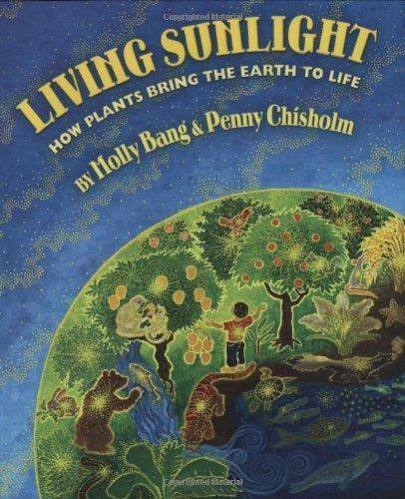 If they want to plant a sunflower seed ask students to rinse out their milk cartons and bring it to Megan. There will be extra cartons there too if they forget. She will do "Secret of a Seed" with the kids. I think all ages will be interested but especially the younger grades. 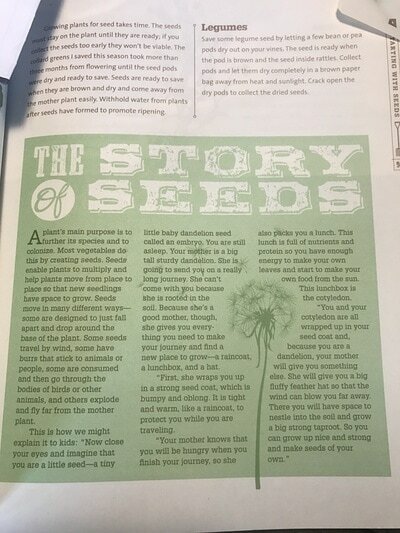 After I have done seed germination with K-2, it's so clear that they LOVE planting seeds and would really like this short, easy and simple project. I would hate for them to miss this. I'm sure they will love taking it home to show their families too!! *Wednesday the 19th - Gather is the Garden is having a guest speaker! 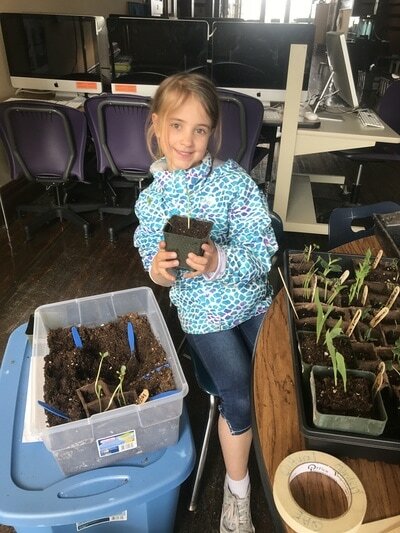 Thank you to parent Mary Rae, (kiddo Collin in 1st grade) Gardening Grandma Bonnie Hedmen from the Seattle Community Pea Patch association, is bringing the world of pollinators to any student who can attend and is interested. Bonnie is also going to do a seed art project. We are lucky to have her be part of our week! Please encourage your students to attend. 2:15-3:30 in the garden. If it's raining it will be inside Mrs. Marks room. Friday the 21st - Peonies and Bake Sale - Ms. Teske will be set up in the Garden selling Peonies after school on Friday! 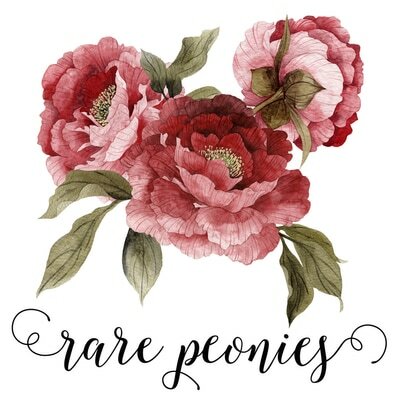 Peonies vary in price by size and rarity, and cost anywhere from $20-$80. Cash and checks are accepted. 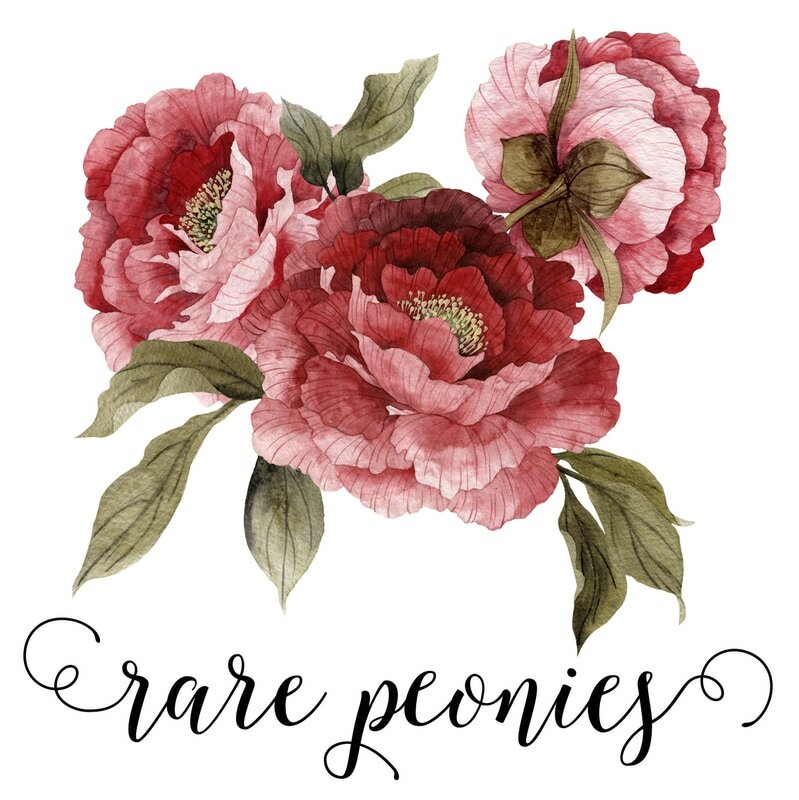 You may purchase through the website too: www.rarepeonies.com Be sure to type QAE next to your first name if you order online. 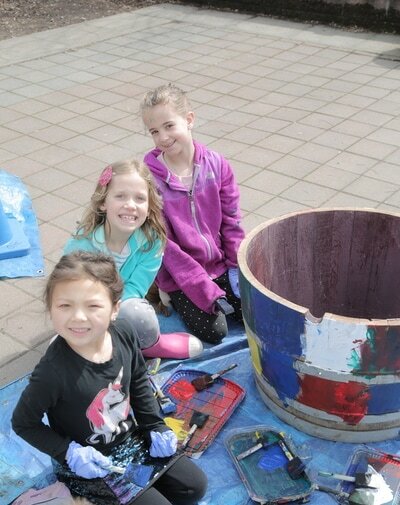 Funds raised will go toward garden related spring, summer and early fall projects and school field trips. Monday the 24th @ 8:00 a.m.
Jane Valencia from the Seattle Storytellers Guild works with students in school and in outdoor settings. 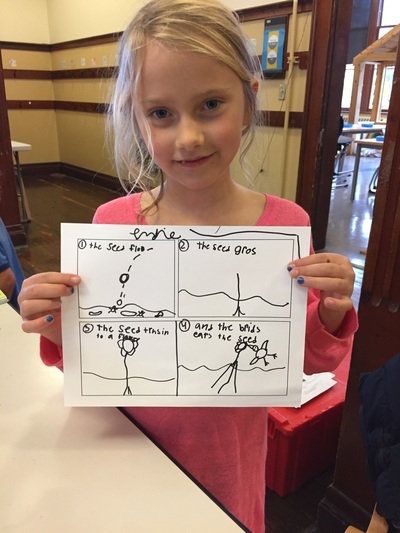 She'll connect students to the Earth through her story telling. She's very excited to be our guest! It's wonderful that all of our students will have an opportunity to experience this! Video links: I'm putting together a list of video links for Mrs. Roy to share at lunch times that revolve around environmental stewardship and Earth Day. *What I can do for our Earth: Students may be handing in a paper to you that states how they can help our Earth be healthy. I or another parent will come to pick them up through out the week(s) and then post them in the lunch room. This is an experiment and will depend on how many parents see the link through FB, the website or classroom parent updates. The Gather in the Garden students are creating a movie based on, Story of a Seed Lisa Taylor's book. This is a story we have read in GG a few times. We would like to show it at lunch hour, on the website and on FB. It's attached if you would like to read it. It's very short. 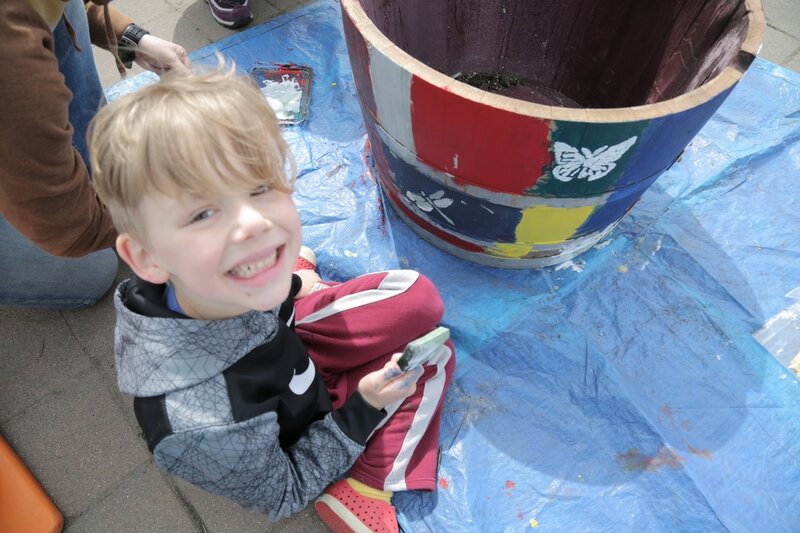 Elizabeth Arzani is using her talents with students to help create prayer flags and decorate the stepping stones to add to the garden. The first plants of QAE Cultural Garden will be planted outside on Thursday or Friday. 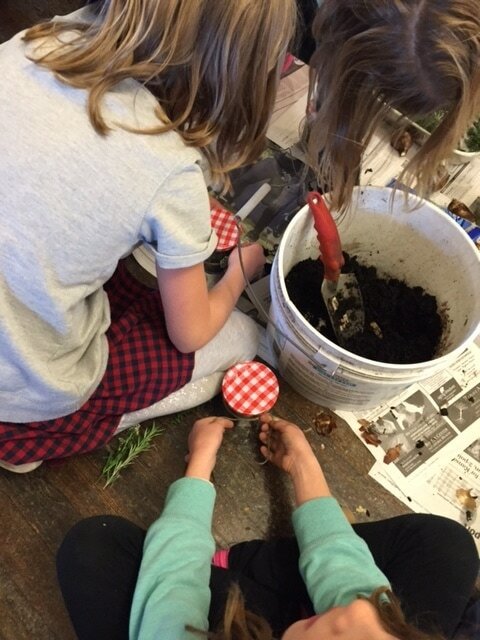 I would like to get the 4th, 2nd and Kindergarten classes who are currently germination seeds to plant outside together and will connect with those teachers directly. If you are a teacher or parent who currently is not involved but would like to just let me know! In the library there is a section featuring only some Earth Day and Arbor Day books Mr. Jeffery has...there are so many more...how lucky are we! 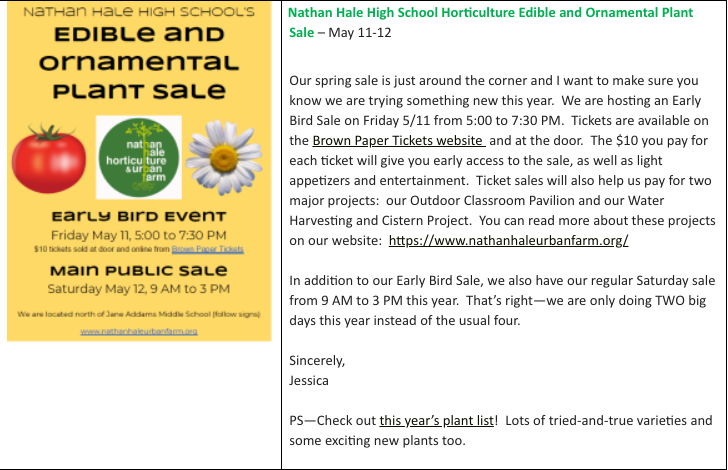 This week a journalist from Queen Anne Magnolia News may be printing a piece about our Garden and the Whole Foods Grant we received! Keep a look out for for the fun! Fall, Spring and Summer work parties/events happen, don't miss them! The QAE Garden is looking for anyone with interest in all or some of the following duties: assist in a casual and creative teaching setting on Wednesdays after school, enjoys concepts of horticulture, earth science, art, crafting, being creative, fun and messy with small groups of children, consistent participation on a team that meets, plans and coordinates regular school wide educational events and celebrations in the garden through out the school year and summer months. Experience in these area is helpful but not necessary. 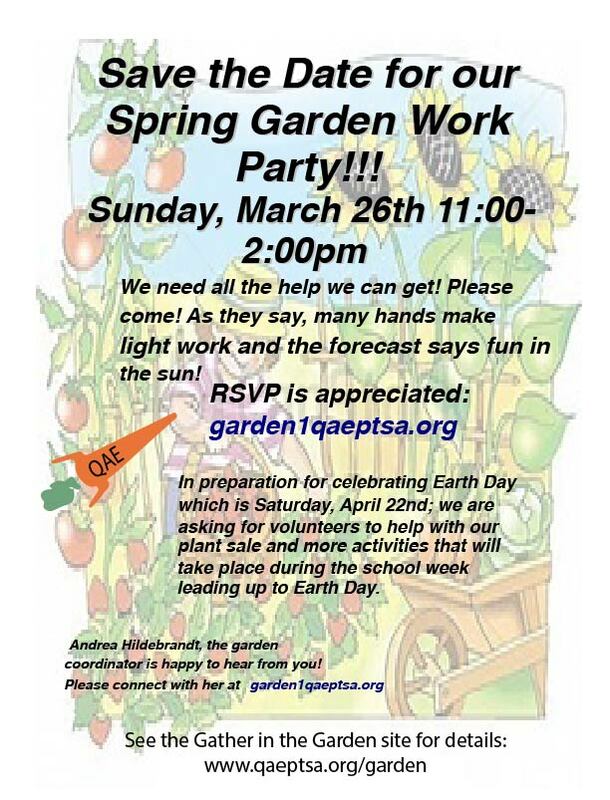 Please connect with the Garden Coordinator at garden1@qaeptsa.org. 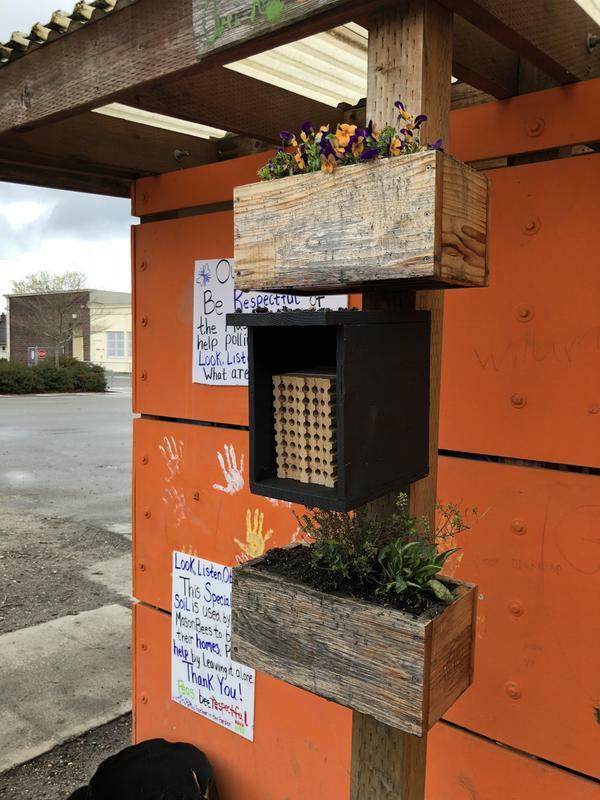 The gardening team could use donations of any of the following: pruning shears, bulb planters, large or medium plastic yogurt containers with lids, masking tape or painters tape, newspaper and brown paper grocery bags, wooden stakes and sting/twine, clipboards, rain gauges. If you are interested in donating any of these or have other gardening items that you think would be useful, please contact Andrea directly at garden1@qaeptsa.org. Learn how to foster young learning and curiosity in a home permaculture garden with Jeremy Puma. 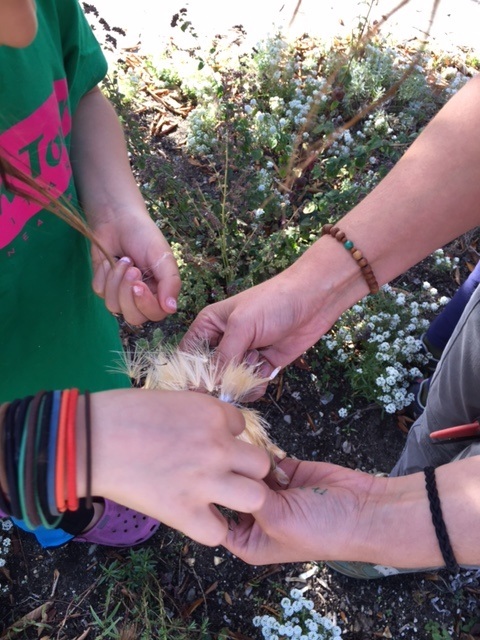 Foraging edible foods, planting seeds and learning about the outdoor world are a few ways that the Puma family has strengthened their bond to nature and each other. Jeremy will focus on how to incorporate garden tasks into the family routine and teach skills for life in the process. This workshop is co-sponsored by City Fruit. 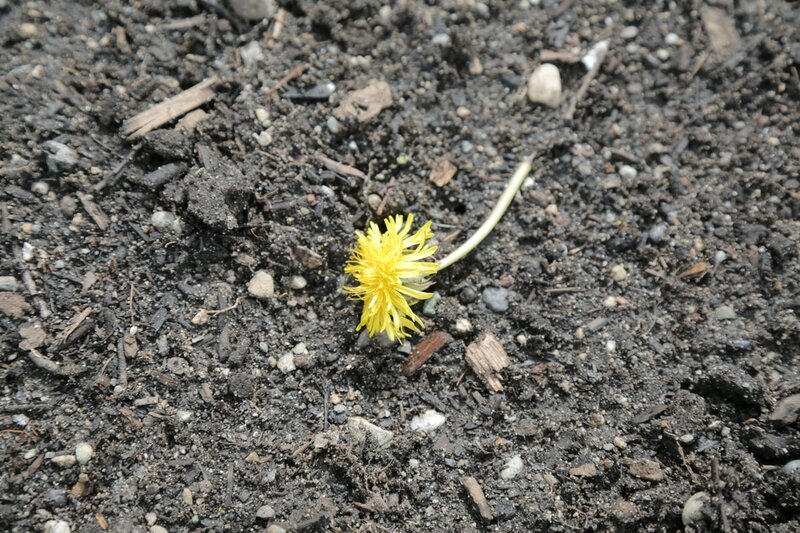 If you haven't noticed, the garden soil has been trampled on by many smaller human feet. This does not help our garden grow. A discussion of solutions will take place this day. We'll also install some garden beds to see if this helps. So, bring your hammers, nails and any extra shelving materials and hooks you might have to donate. We'll be using this material to organize our garden shed. We need all the help we can get! Please come! As they say, many hands make light work. Besides, the forecast says fun in sun. 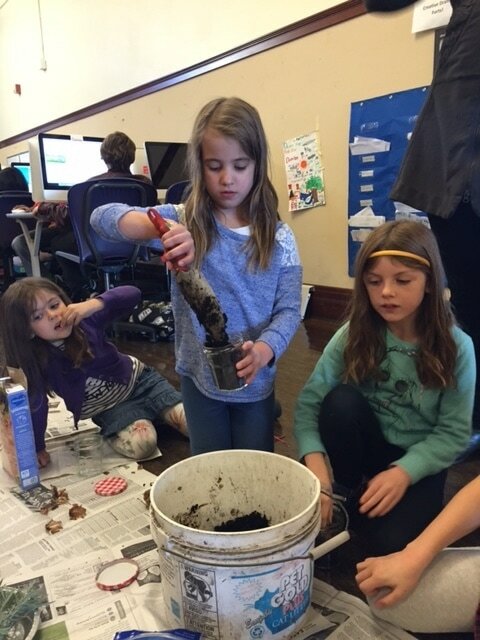 There will be a drawing for two tickets to the Seattle Children's Theater and you never know you might be lucky enough to find some treasure buried in the compost! Come and have fun. There will be refreshments and snacks. 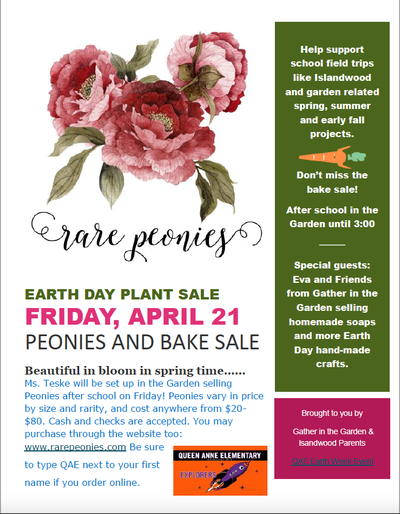 In preparation for celebrating Earth Day which is Saturday, April 22nd; we are asking for volunteers to help with our plant sale and more activities that will take place during the school week leading up to Earth Day. Contact Andrea if you'd like to help! Past Events - How did it go? Shoutin' out to Mrs. Marks! We are so grateful for her sharing her classroom with us after school. 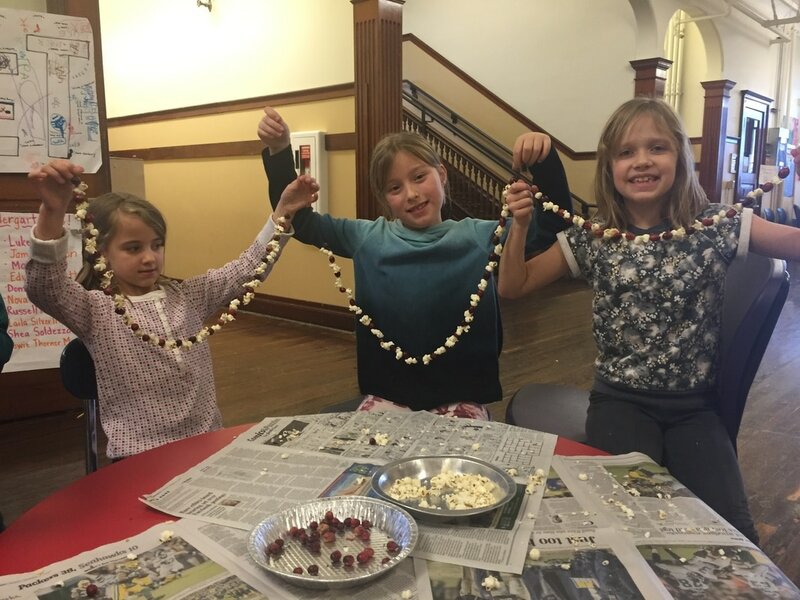 We are so grateful for a warm place, to share snacks, hear new stories, plant bulbs, make our own water cycles, string popcorn garland, sing with the drum and paste together our visions! Whoot! We're ready to get outside now that the sun is out making longer days for us to gather in the garden. All I can say is that we came, had fun, we dug, we cut, we hulled, had pizza, got a little crafty and worked hard!! We had enough people to get the job done and that is awesome! There is still some compost left over. Yes! There is a plan for it. No! It doesn't include having students climb and play all over it. Then again, what does one expect of our amazing, creative, strong spirited students. Play on I say! It won't be there forever but special thank you to those who monitor the playground. You keep not only our students safe but look out for the garden and the rest of the grounds as well. It will be exciting to see the bulbs pop up in the spring. We planted a "mystery" mix donated by one of the day of garden crew. Pics will be posted soon. I am hoping that there is another good turn out at the next Garden Gathering. Stay tuned for date and time! Our very first Gather in the Garden event 2016 went really well! All it take is a few families to come out and it's a party! Tons of fun was had despite the rain. 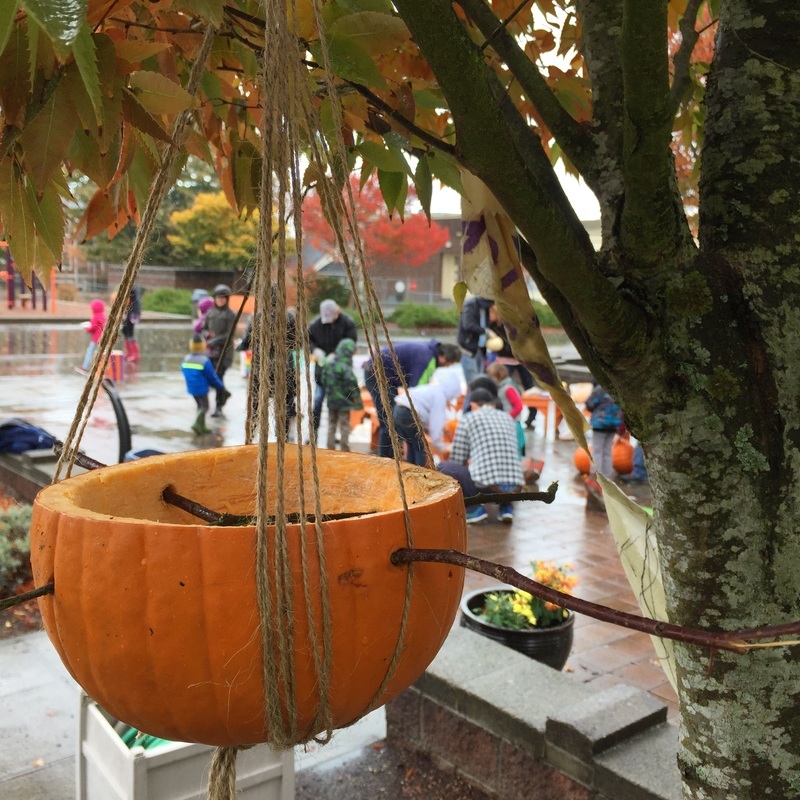 We learned about pumpkin seeds, how to keep your jack-o'lanterns from rotting so quickly, what critters live among us and how to make a pumpkin bird feeder. We shared, carving tools, donuts, coffee, warm apple cider, marsh mellows, laughs and memories. Thank you to everyone who came out! 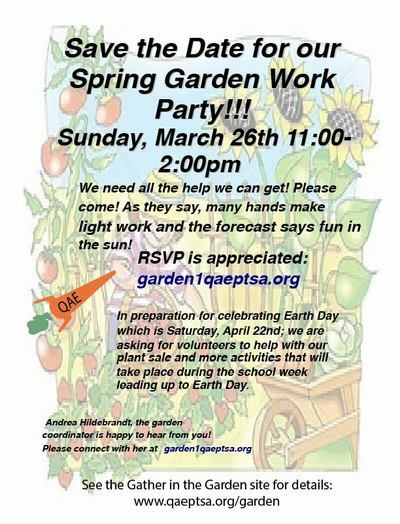 To RSVP for future events and for any garden questions connect with Andrea at garden1@qaeptsa.org. QAE student transporting bean, pea, watermelon, sunflower and tomato seedlings over spring break. Well done! Thank you MaryRae for the poster! Thank you to Five Corners Hardware for your generous donation! 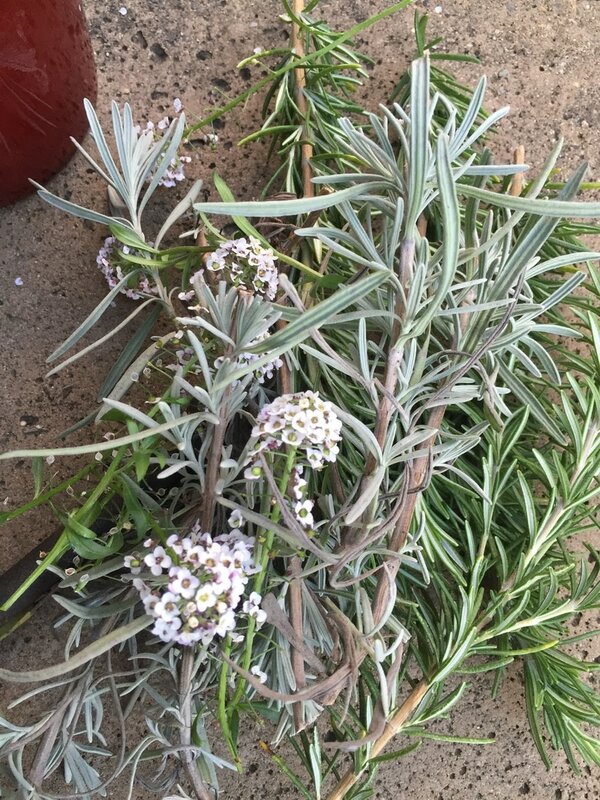 Rosemary, lavender and alyssum cut from the garden for decorating winter bulb jars. 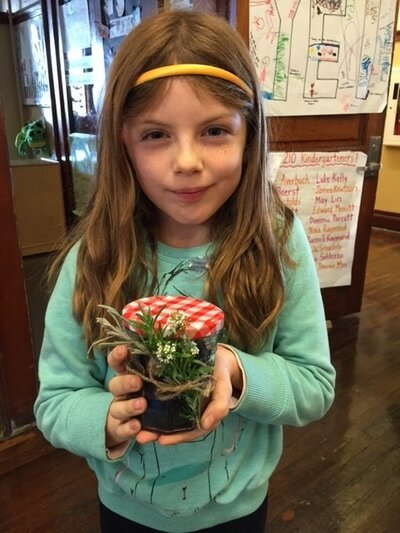 Second graders are garden masters! 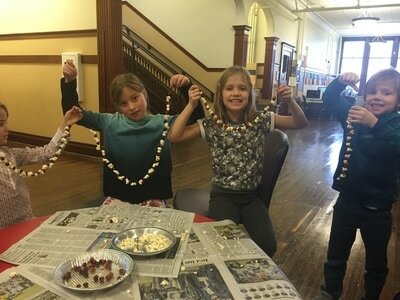 GG "Winter Style" First and Second graders making winter garland. Seeds and Berries! 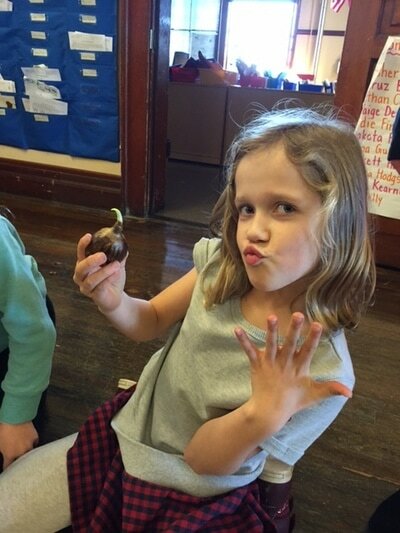 Second grader feeling good about her winter bulb planting! Well done Tilly! 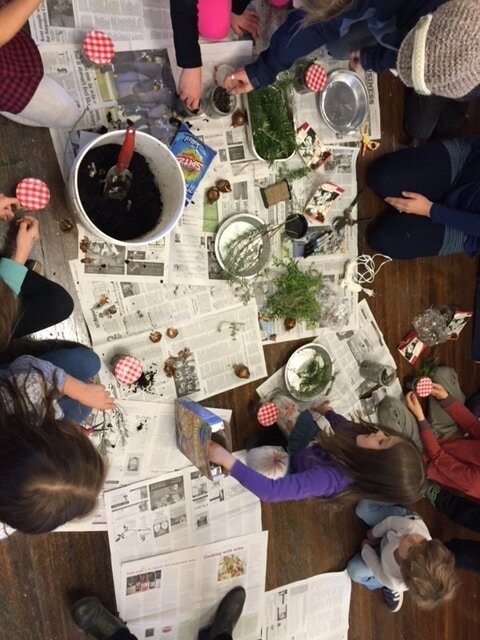 More QAE students hands on learning about bulbs! We're always gonna be "GOAL Diggers!" The turn out for this event was great! We had fun, worked hard, and had more fun! Second graders teaching us the energy cycle through plants and sunlight. So smart! Such a great book for children of all ages! Must check it out!! 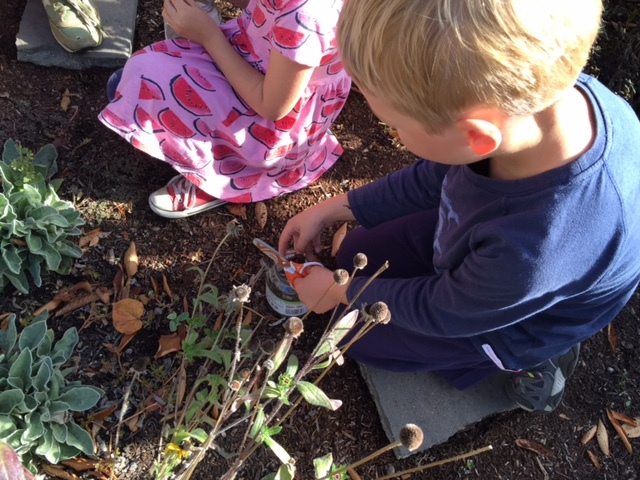 Kindergarteners collecting seeds on a sunny Fall day. Lots of cone flowers will provide seeds to grow plants in March and sell at our Spring plant sale. Lets go germination!! Hot cider on a fall day!